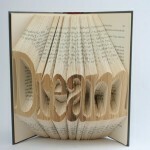 yes, it is a book that has been carved to read “Dream”. That takes a sharp knife and a steady eye. I love that idea. The books look adorable stacked like a tree. Thanks for sharing. Thanks…I love collecting alternative ideas….the books appealed to me also.